Waves of light emanate from an object sighted by amateur astronomer Li Feng over China's Sichuan province. Amateur astronomers in China's Sichuan and Yunnan provinces reported seeing the weird phenomenon on Nov. 11. They watched as a luminous object moved through the heavens, shimmering with rays or rings of light. The reports made a splash on Chinese news websites such as Sina.com, as well as the Astronomy.com.cn discussion forum. For a while, Chinese experts speculated that the object might have been a comet — but skywatchers soon figured out that the sightings occurred less than an hour after Arianespace sent the Eutelsat 21B and Star One C3 satellites into orbit (from the European Space Agency's South American spaceport, where it was still Nov. 10). "The detailed analysis of the height of the UFO and the timing of observation leads me to conclude that this was the ESC-A upper stage, 30 minutes after all the fuel leaked out via passification," a Hong Kong observer known as Galactic Penguin SST reported last week on the NASASpaceflight.com forum. Today, Want China Times said that the Beijing UFO Research Society has reached a similar conclusion. "The 'rays' were most likely the rocket jettisoning boosters or other parts and entering low Earth orbit after being launched 30 minutes previously," the Taiwan-based online publication reported. It's also possible that the swirls of light came from fuel or vapor emanating from the upper stage. Such explanations are consistent with a host of other rocket-related UFO sightings over the years, including Russian rocket stages that have been spotted over the Middle East and Scandinavia. 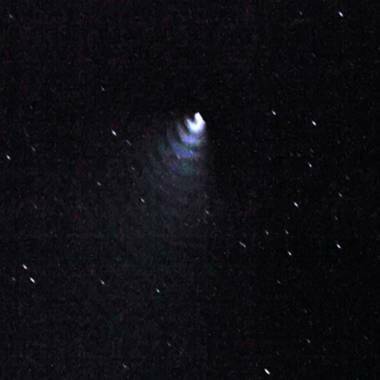 Did missile test spark Chinese UFO sightings?